Spread 1 tablespoon dressing on each tortilla, covering entire surface. Top each with lettuce leaf and half of beef, cheese and onion. Roll up each tortilla tightly. 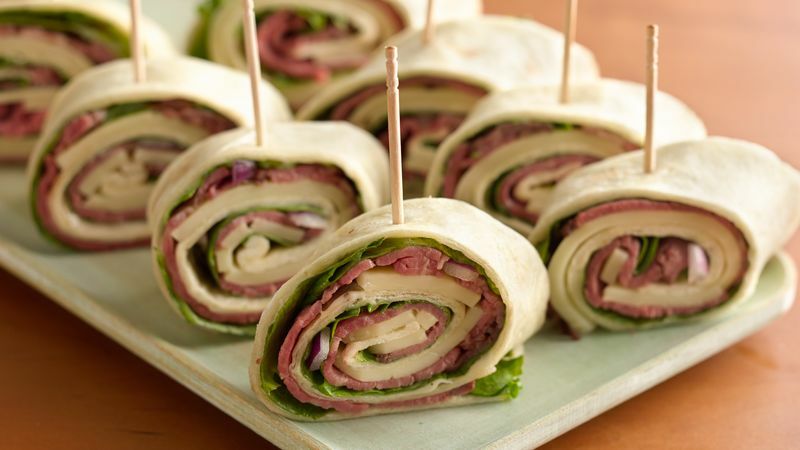 To serve, cut roll-ups into 1-inch slices. Insert cocktail toothpick into each to secure. Serve with pickle wedges. Next time, use smoked turkey or ham instead of the roast beef and Cheddar cheese in place of the Swiss. To make ahead, prepare, cover and refrigerate up to 1 hour.